You are here: Home / News / Using film/video in your research? 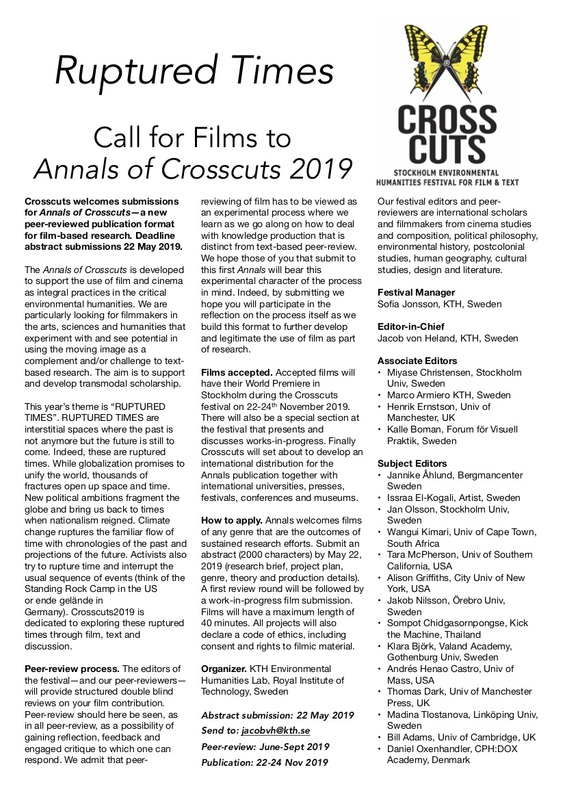 Call for Films Annals of Crosscuts 2019 - RUPTURED TIMES. Are you using film in your research practice? It could be within environmental humanities, humanities more broadly or social and natural science. Annals of Crosscuts is an emerging publication for film research with a double-blind peer-review. Accepted films (max 40 min of length) will have premiere in the ANNALS OF CROSSCUTS section of Crosscuts Stockholm Environmental Humanities Festival for Film and Text the 22-24 November 2019. Please consider submitting your own work or encouraging others to apply. Abstract submission: 22 May 2019. The Annals of Crosscuts is developed to support the use of film and cinema as integral practices in the critical environmental humanities. We are particularly looking for filmmakers in the arts, sciences and humanities that experiment with and see potential in using the moving image as a complement and/or challenge to text- based research. The aim is to support and develop transmodal scholarship. This year’s theme is “RUPTURED TIMES”. RUPTURED TIMES are interstitial spaces where the past is not anymore but the future is still to come. Indeed, these are ruptured times. While globalization promises to unify the world, thousands of fractures open up space and time. New political ambitions fragment the globe and bring us back to times when nationalism reigned. Climate change ruptures the familiar flow of time with chronologies of the past and projections of the future. Activists also try to rupture time and interrupt the usual sequence of events (think of the Standing Rock Camp in the US or ende gelände in Germany). Crosscuts2019 is dedicated to exploring these ruptured times through film, text and discussion. Peer-review process. The editors of the festival—and our peer-reviewers— will provide structured double blind reviews on your film contribution. Peer-review should here be seen, as in all peer-review, as a possibility of gaining reflection, feedback and engaged critique to which one can respond. We admit that peer-reviewing of film has to be viewed as an experimental process where we learn as we go along on how to deal with knowledge production that is distinct from text-based peer-review. We hope those of you that submit to this first Annals will bear this experimental character of the process in mind. Indeed, by submitting we hope you will participate in the reflection on the process itself as we build this format to further develop and legitimate the use of film as part of research. Films accepted. Accepted films will have their World Premiere in Stockholm during the Crosscuts festival on 22-24th November 2019. There will also be a special section at the festival that presents and discusses works-in-progress. Finally Crosscuts will set about to develop an international distribution for the Annals publication together with international universities, presses, festivals, conferences and museums. How to apply. Annals welcomes films of any genre that are the outcomes of sustained research efforts. Submit an abstract (2000 characters) by May 22, 2019 (research brief, project plan, genre, theory and production details). A first review round will be followed by a work-in-progress film submission. Films will have a maximum length of 40 minutes. All projects will also declare a code of ethics, including consent and rights to filmic material. Our festival editors and peer- reviewers are international scholars and filmmakers from cinema studies and composition, political philosophy, environmental history, postcolonial studies, human geography, cultural studies, design and literature.